You’ve probably seen the commercials or heard the ads on the radio—the McRib is back for 2018! McDonald’s famous (or infamous depending on your palate) sandwich has returned to stores for a limited time. It’s been a year since the McRib’s last appearance and since then, the people have been clamoring for the sandwich. When the McRib officially arrived in Hampton Roads, a local radio station hosted a giveaway at a McDonald’s in Virginia Beach where listeners could come and get a free McRib. The McRib first debuted in 1981 and since then has made several appearances over the years, making the item a heavily sought-after rarity. I began my journey to McRib by visiting the McRib Locator website. I entered my address and found that none of the McDonald’s near me had a confirmed McRib sighting. The website relies on crowdsourced information which doesn’t guarantee that the McRib hasn’t sold out at the confirmed locations. Next, I decided to cold call all of the McDonald’s close to my apartment and job. Not sure what’s going on at the McDonald’s in Virginia Beach but none of the locations I called answered the phone. Much like McDonalds’ ice cream machines, their phones don’t seem to work either. I took a chance and pulled into the drive thru of the McDonald’s on General Booth Boulevard in Virginia Beach. The McRib is only available in 9,000 of the fast food restaurant’s U.S. locations this year. I’m not a math person so I had no idea what my odds were. I was optimistic when I saw the McRib display at the top of the menu. “Do you still have the McRib?” I asked. “Yes, we do,” the cashier cheerfully replied. This McDonald’s location is easily the friendliest I’ve ever been to. I paid $4.09 plus tax at the first window, then when I got to the second, I was told to pull into the online ordering spot as myself and the person ahead of me would have to wait. After about four minutes, I was startled when a McDonald’s employee knocked on my window to hand me my bag. The bag was noticeably warm so I figured some part of the McRib was fresh-ish. I got home and eagerly took my McRib out of the bag. As I opened the box, I felt like a kid opening a new gift. The actual aesthetic of the McRib was slightly underwhelming. The McRib looks like a small rack of ribs, but its actually pork shoulder. 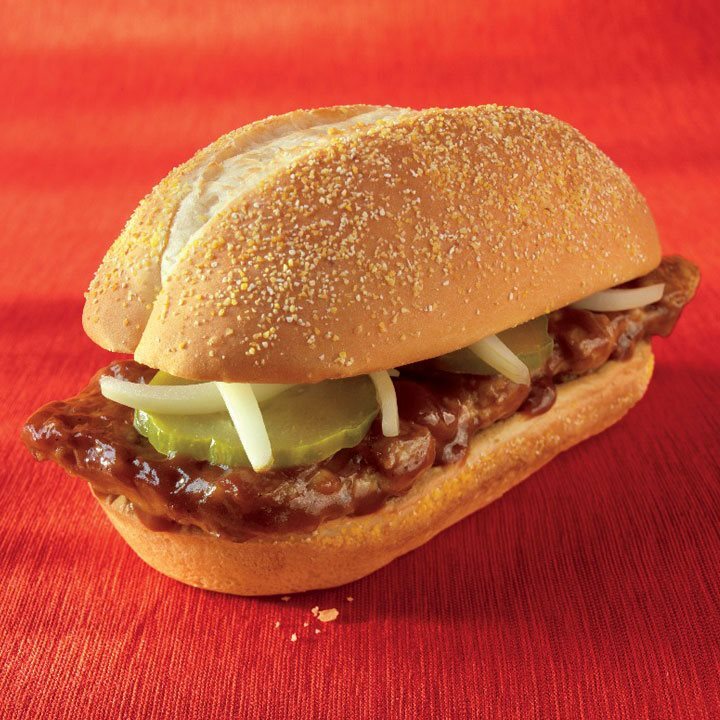 The McRib pork patty is slathered in barbecue sauce and served on a hoagie roll with raw onions and pickles. The first thing I noticed about the McRib was the overpowering smell of sweet barbecue sauce. It hit me as soon as I received my bag and returned when I opened my box at home. With my first bite, I wanted to taste the pork patty on its own. While I’ve read and been told by multiple people that the McRib does NOT have any bones in it, I needed to see for myself. Initially, the taste of the patty wasn’t too bad and was, in fact, boneless. The generous serving of slightly tangy barbecue sauce (that tasted a lot like bottled Kraft barbecue sauce) helped exponentially. The patty was no where near as tender as the meat from actual pork ribs but it was surprisingly juicy. After careful analysis of the pork patty, I wanted to bring in the onions and pickles for my second bite. When I talked to other people about their McRib experience, I was told to order it without onions. Since this was my first time trying the sandwich, I wanted to experience it the way it should be served. However, I quickly understood why people would order it without onions. The slivers of uncooked yellow onion are incredibly off-putting and the pungent taste does not complement the sweetness of the barbecue sauce. On the flip side, I did enjoy the acidity the pickles brought to the sandwich. As I finished the rest of the sandwich, I kept trying to figure out what the McRib patty reminded me of. Then, it hit me. Is this essentially just one of McDonalds’ breakfast sausage patties? The texture of the patty was so familiar. If this is the case, why is the McRib a limited-edition item? My guess is that its elusiveness drives its popularity and cult-like following. While I won’t be in a hurry to scarf down anymore McRibs this year, I can say that trying one is certainly a unique experience. I can think of a few ways that McDonald’s can improve their McRibs, like finishing it on the grill for a slight char or caramelizing those awful onions. Overall, I don’t think the McRib is bad and I can see why people get so excited to have it after waiting a year or longer, especially if you actually enjoy it. I think I’ll stick to simply ordering McNuggets and fries when I go to McDonald’s.